I have to be honest, Italian has never been my first choice of cuisine when choosing a place to go for dinner. I am not sure why, but I am now going to be changing my ways, as our evening at Al Duomo made me realise what eating Italian food out is all about. 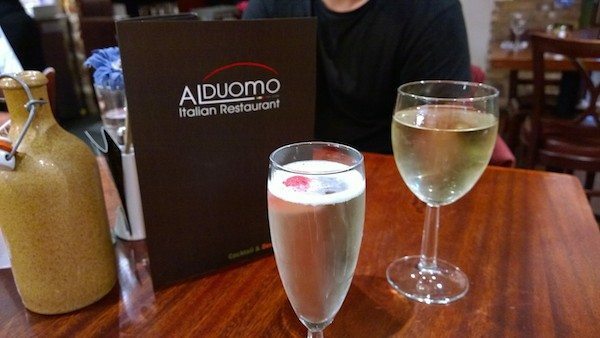 Al Duomo has been a popular Italian Restaurant in Brighton for many years, hosting weddings, events, and private parties regularly. The night we visited it was drizzly, windy and cold, so there was nothing more welcoming than a warm restaurant with smiley staff. We were greeted and seated straight away, and our drink orders were taken, I chose an Italian prosecco and my partner went for a Sauvignon Blanc. The restaurant wasn’t too busy, although it was only 6pm, but soon filled up with a couple of other diners, and a few larger groups of people upstairs. We had a seat next to the wood fired oven downstairs, which was good when the pizza orders came in to watch the dough being spun and prepared. The menu looks large on appearance, but really it isn’t too overwhelmingly big. 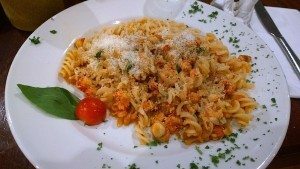 It is split into starters – cold or hot, mains, pastas or pizza. Each dish that is gluten free friendly has a small ‘gf’ next to it, and other dietary requirements had their own symbols which I found really useful. There is a good amount of gluten free dishes for each course, and nearly all of the pasta dishes can be made gluten free! Sadly, they don’t do gluten free pizza, due to the preparation space being too small and there is too much risk of cross contaminating with normal flour. The manager also told me that if you did order a dish that is gluten free, when the order is sent to the kitchen the order will also have gluten free on it so the chefs are very aware. It’s great that they take it so seriously, as is can be hard to find places that do! Our drinks arrived, and the prosecco was lovely. It came with a strawberry inside, it wasn’t too sweet, and a little bit dry which I liked. The Sauvignon Blanc was clean, and not too acidic which was nice too. 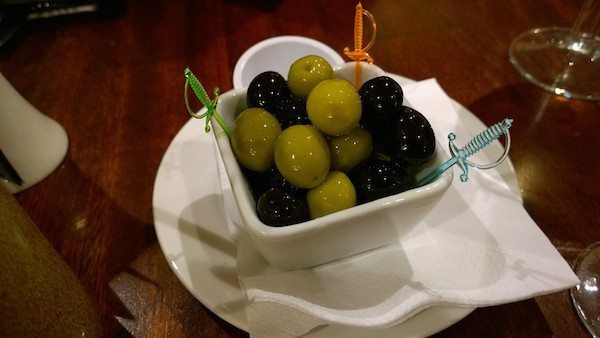 We were also brought a small dish of olives to share that were tasty, and good to get the taste buds going. We ordered our starters, and after not very long at all they had been placed in front of us ready to eat. I had the mussels, which on their menu they’re called Cozze Alla Marinara, and my partner went for the Arancini – crumbed balls of risotto with mozzarella and deep fried. 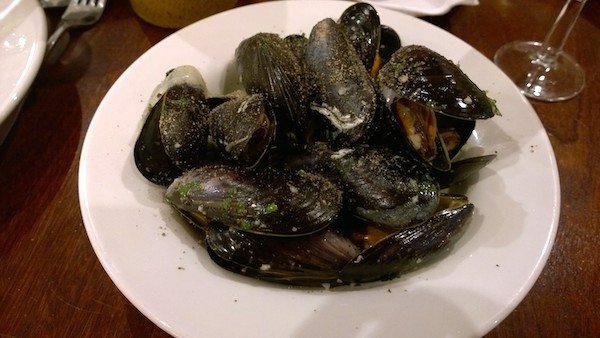 The portion sizes are very generous, my bowl was stacked high with mussels, and the sauce that they were in was lovely. It was made with white wine, cream, soft onions and garlic and had flecks of parsley throughout. Our waitress offered freshly cracked pepper at the table too which is always welcome with me. 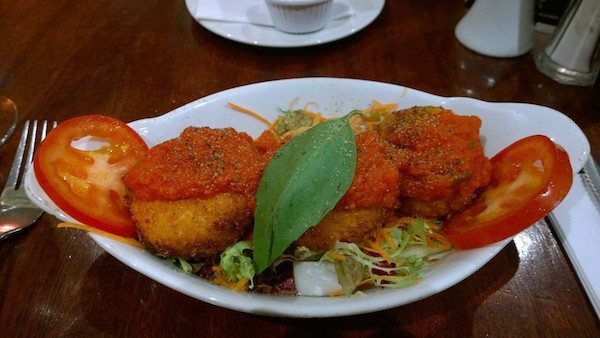 The Arancini were large, and were very comforting, crispy on the outside, with plenty of cheese throughout, and a delicious tomato sauce on top. After our starters we were extremely happy and impressed, and it was this moment that I decided that I really really liked it here. Our plates were cleared swiftly, and we both wriggled around in our seats to make room for our mains. There seemed to be a couple of big groups of people that were now dining upstairs, and this was good for the atmosphere as it seemed to pick up. The kitchen must be downstairs in the basement, or on the upper floor, as they use a dumb waiter to send the food up, every time it rung we watched over eagerly, and after not much wait at all our food was delivered to the table. We were offered a sprinkling of parmesan cheese with our food straight away, and the freshly cracked pepper once again. The plates were full of delicious smelling food and I just couldn’t wait to dig in. I ordered the gluten free pasta with crayfish tails, scallops, cherry tomatoes and chilli. 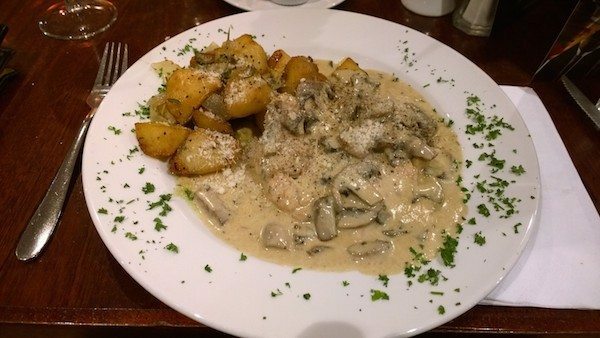 My partner ordered the chicken breast with roasted potatoes and a creamy mushroom sauce. My pasta was cooked perfectly, and the flavours were well balanced throughout the dish. It’s hard sometimes to get gluten free pasta right, but they seemed to know how to cook it so it is spot on. The chicken dish was a hefty portion, the chicken was cooked well, and wasn’t overdone, and the roast potatoes were crunchy, well seasoned and generously coated with rosemary. The creamy sauce had a wonderful mushroom flavour and was plentiful, making it last the whole dish. We both struggled to get through our mains, as the starters and the mains were of very decent sizes. We had a look at the dessert menu in case we magically created room in our very full bellies. For dessert they have traditional Italian tiramisu, gelato in many flavours, and creme brulee which I always have a soft spot for, plus many more tasty treats. The ice creams are all gluten free, as well as the creme brulee, so there is a fair bit to choose from if you need to avoid wheat. Just as we both decided that we really couldn’t fit anything in, our lovely waitress insisted that we have a piece of the gluten free carrot cake that she prepared for us especially. This was on a plate drizzled with honey and cream, and was a large slice that only your Grandma would be that kind to cut for you. The cake was moist and crumbled just the right amount, with a really punchy amount of spices, and a creamy, cream cheese icing on top. 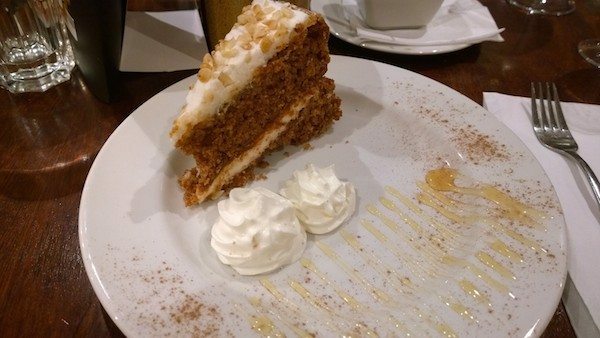 It was one of the nicest gluten free carrot cakes that I have had, so they sure know how to bake too! I loved our evening at Al Duomo, and we are definitely going to be heading back there soon. It was welcoming, comfortable and comforting, with no frills, delicious food, and a distinctive and plentiful gluten free selection. It’s great for families, groups, or a romantic meal for two, and do check out their pre-theatre set menus, as it’s a fantastic place for stopping by before a show!